If you’re a social media marketer, then odds are you’ve heard of word of mouth (WOM) marketing. However, the path to WOM mastery doesn’t happen overnight. The first and most important step in becoming a word of mouth marketing champ is identifying your relevant audiences. One of the best ways to do this is to identify individuals with specific knowledge or an influential voice in a particular area or product related to your brand. Why is this the most important step? If you don’t focus on a hyper-relevant audience, your WOM efforts won’t be nearly as successful. Additionally, customers acquired through social influencer efforts have a 37% higher retention rate. It’s important to distinguish the different “types” of influential audiences that exist, and how they vary. Here are the three types of audiences that are assets to your social strategy. Influencers are those individuals in a community who affect purchase decisions, due to (real or imagined) influence, position, knowledge, relationship, or authority. When it comes to consumer spending, influencers are generally members of a peer or reference group. Research shows that a small number of active influencers accounted for a disproportionate share of total recommendations. They’re a vital group to incorporate into your social strategy. Don’t fall into the trap of assuming it’s all about follower count, though. An influencer doesn’t need to have the follower count of Taylor Swift or Justin Timberlake. Though the two musicians certainly exert their own level of celebrity influence, if they aren’t relevant to the audience you’re trying to reach, then they won’t be an asset to your social strategy. There are also citizen, or industry, influencers to be found in audiences that are hyper-focused on a specific niche or community. Brand advocates are individuals that spread positive word of mouth messages about a brand or product to other people in their network. They’re different from influencers in that they do not necessarily hold the power to influence purchase decisions within their community or industry. 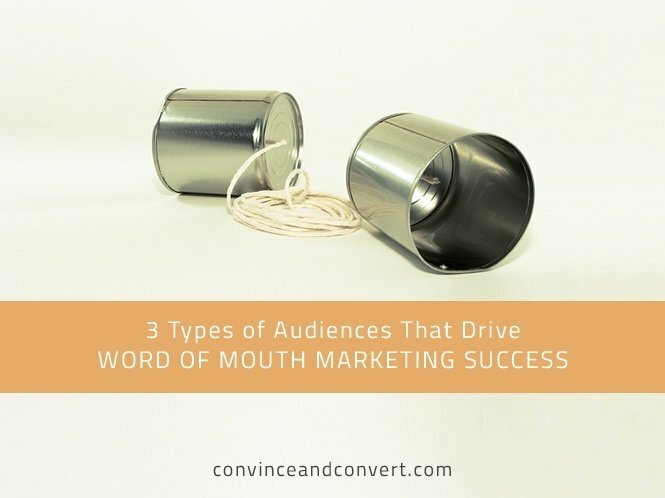 Nevertheless, they are an important component of word of mouth marketing. After all, 85% of fans of brands on Facebook recommend brands to others. And since 92% of consumers trust recommendations from other people—even if they don’t know them personally—over promotional content that comes directly from brands, it’s important to use that leverage. Last, but certainly not least, are customer advocates. Customer advocates are similar to brand advocates in that they are also individuals that spread word of mouth about a brand. The difference, however, is that customer advocates are not only satisfied with your product but with your customer service as well. Not only is it important to have a good product, but you must also build good relationships with your customers. Brands that inspire a higher emotional intensity receive three times as much WOM as less emotionally-connected brands, and positive experiences are three times as likely to generate word of mouth than negative ones. Customer advocates can be the best referral business you have, so be sure to engage them. They’re the champions that will drive the best word of mouth about your brand. Once you have identified these audiences, the second step is building out a way to engage authentically. Success of any WOM campaign hinges on authenticity. Once you start the conversation with your audience, it’s important to continue to nurture those relationships through real interactions. Your community cares enough to engage with your brand, so make sure they know you care, too. Remember: 81% of U.S. online consumers’ purchase decisions are influenced by their friends’ social media posts versus 78% who are influenced by the posts of the brands they follow on social media. Focus on the individual with personalized messaging and 1:1 interactions. Truly listen to what your audience has to say. Be honest, and don’t over-promise if you can’t deliver on something. Admit when you’re wrong—everyone makes mistakes, even big-time brands. Knowing the differences among your audiences and engaging with them authentically is your first step towards rocking word of mouth marketing on social. For more tips on optimizing your social strategy and becoming a word of mouth champ, be sure to check out these eBooks from Insightpool!